The Leapfrog Group is a national not-for-profit organization established by coalition of health care purchasers, sought to address the need for a standardized method to evaluate patient safety in US hospitals through creating a composite safety score. Leapfrog Group was founded and launched in Nov 2000. Leapfrog Hospital Safety Scores are based on surveys submitted voluntarily by hospitals across the country for the purpose of transparency and improvement. The survey assesses hospitals on three key areas: how patients fare, resources used in caring for patients, and leadership and structures that promote patient safety. The Hospital Safety Score benefits purchasers, providers and hospitals by supporting informed health care decisions by those who use and pay for health care; and promoting high-value health care through incentives and rewards. The Hospital Safety Score is a letter grade of A, B, C, D, or F reflecting patient safety within a hospital. Participation and submittal of data is free and voluntary for each hospital. The Leapfrog Hospital Survey is distributed to the hospitals annually from April 1st to December 31st. Data for each report is derived from the previous Calendar Year. The report offers a national-, state-, and hospital-level report for each measure. Leapfrog applies the minimum reporting requirement for using the measure in the safety score: the number of cases in the denominator must be >= 30. The score includes data that patient safety experts use to compare hospitals. Publicly available data from the Centers for Medicare and Medicaid Services (CMS), the Leapfrog Hospital Survey, and secondary data sources are weighted and then combined to produce a single composite score that is published as an A, B, C, D or F letter grade. 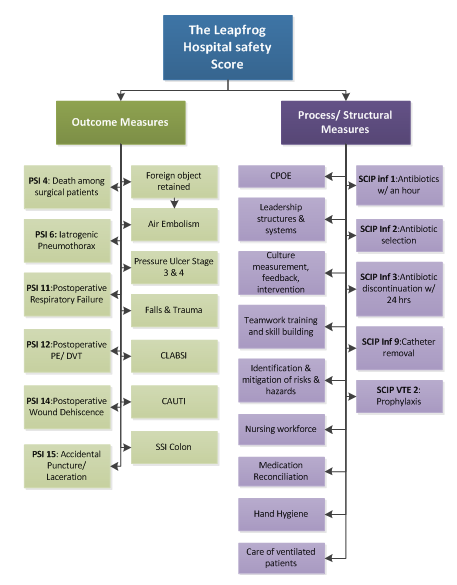 Hospital performance on each measure was converted to a ‘z-score’ and then aggregated using measure-specific weights. Each individual measure included in the Hospital Safety Score is assigned a weight. The methodology to assign weights includes three criteria that reflect the quality of the measure. These criteria are: (1) Impact, (2) Evidence, and (3) Opportunity. These three (3) criteria are then combined using the following equation to compute a relative importance score for each measure: [Evidence + (Opportunity x Impact)]. The score computed from this calculation is then used to calculate an overall weight for each measure. The Opportunity Score for each individual measure is based on the Coefficient of Variation (Standard Deviation/Mean) of that measure, using the following formula: [1 + (Standard Deviation/Mean)]. The Opportunity Score is on a continuous scale that is capped at three (3). Any measure with an Opportunity Score above three (3) is assigned a three (3). Once all data elements have been collected for a given hospital and all missing data have been scored appropriately, the Hospital Safety Score can be calculated using the methodology described below. Z-Scores are used to standardize data from individual measures with different scales. Z-Scores can tell a hospital whether their score on a particular measure is above, below, or equal to the mean. To find the weighted process score, first multiply the z-Score of each process measure by the weight assigned for that measure to get the weighted process measure score.